Mixing fitness with culture makes for an interesting combination. That’s why our LdM Event Planning students this year decided to organize this incredible hike from the city to the countryside. People from different cultures will have the opportunity to hike together and see beautiful sights that are rich with history and meaning. 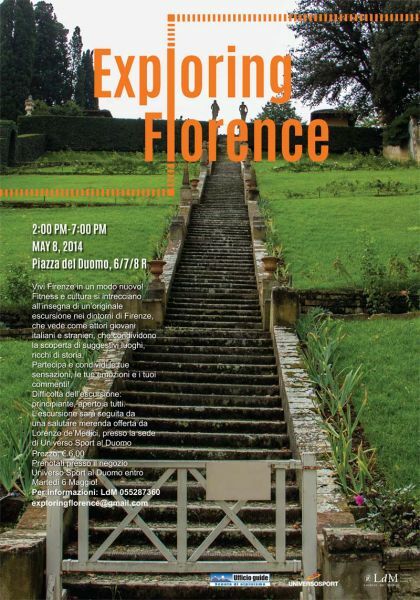 In other words, ‘Exploring Florence’ is a great opportunity to experience the city of Florence in a new way! To kick off the afternoon, a brief overview will be given of what this event is all about, followed by a 2-3 hour hike with many fascinating stories of history told along the way. This hike will be an easy level, so everyone is welcome to join! The hike will be followed by a healthy snack at the Universo Sport store. During the hike, guests will have the opportunity to share feelings, emotions and thoughts with people from different cultures and through interviews, videos and more!